The purpose of the Lay Organization is “to organize and train the laity of the African Methodist Episcopal (A.M.E.) Church so that lay persons may maximally utilize their God given abilities and skills to improve and extend the kingdom to create happiness, peace and harmony among its members.” Guided by the A.M.E. Church’s Connectional Lay Theme: “Laity-Fulfilling the Great Commission of the African Methodist Episcopal Church,” and scriptural reference, Matthew 28: 16-20, the members of the Clara B. Neal (CBN) Lay Organization continually strive for improvement of self and service in order to fulfill that purpose. 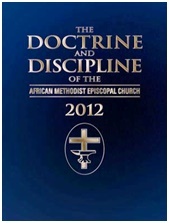 introduce new members to the doctrine of African Methodism and to serve as a refresher course for current members of Allen Chapel A.M.E. Church. Below are the A.M.E. Doctrine and Discipline as it was printed in 1817, and the updated 2012 version which is still in publication.